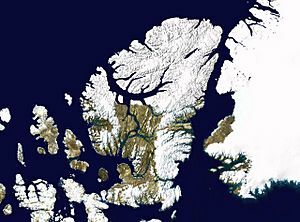 Ellesmere Island is part of the Qikiqtaaluk Region of the Canadian territory of Nunavut. It is in the Canadian Arctic Archipelago, part of the Queen Elizabeth Islands. Cape Columbia is the most northerly point of land in Canada. The area of Ellesmere Island is 196,235 square kilometres (75,767 sq mi), the world's tenth biggest island and Canada's third biggest island. 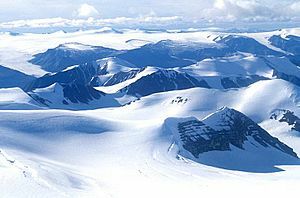 The Arctic Cordillera mountain system covers much of Ellesmere Island: it is the most mountainous island in the Canadian Arctic Archipelago. The Arctic Willow is the only woody species to grow on Ellesmere Island. In 2001, 168 people lived on Ellesmere Island. There are three settlements on Ellesmere Island including Alert, Eureka, and Grise Fiord. Canadian Forces Station (CFS) Alert on Ellesmere Island is the northernmost settlement in the world. 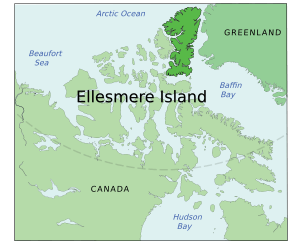 Ellesmere Island Facts for Kids. Kiddle Encyclopedia.